All Overs rebuilt grand pianos are finished and prepared to standards the equivalent of the concert and broadcast instruments rebuilt for the Australian Broadcasting Corporation (ABC) in Sydney and Brisbane. Custom rebuilt grand pianos are produced to order. A period of four to twelve months may be required for acquiring a suitable instrument, undertaking the rebuild and preparing the piano prior to delivery. All rebuilt and new pianos carry a ten year warranty. Overs Pianos has a history of producing custom rebuilt grand pianos spanning a ten year period. 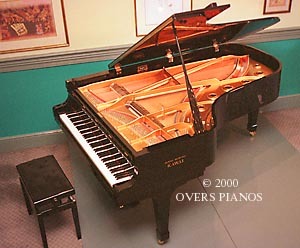 Overs Pianos has rebuilt several Steinway D's for various professional clients and venues since 1990. The first two (Pymble Ladies College 1990 and the ABC Ultimo center 1992) were rebuilt incorporating a redesigned string scale. This improved scale exhibits superior tuning stability when compared to the original Steinway D factory scale. 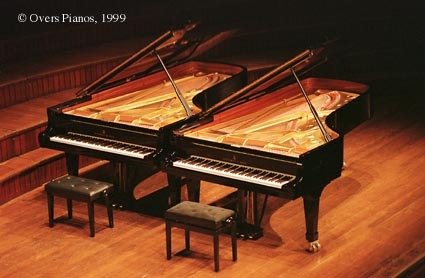 In 1995, Overs Pianos manufactured and installed tuned, individual rear duplex blocks into the rebuild of a Steinway D (Queensland ABC's circa 1963 Steinway D - rebuilt 1995). This modification allows for a cleaner tone in the treble sections. This technology is used in all Fazioli grand pianos. It is not applied to modern Steinway Ds, but was incorporated in Stienway Ds produced during the 1870s. There remains considerable debate regarding the merits of this technology. In 1999 Ron Overs spent much of the year investigating improvements to the geometry of grand piano actions. A new design was developed on CAD from July to October '99, and action models were built and assessed from November to March 2000 when a patent application was lodged with the Australian Patents Office. The first Overs action was fitted to a new Overs Steinbach 225 grand piano for exhibition at the July 2000 Australasian Piano Tuners and Technicians Convention in Sydney. This action is now standard equipment for all Overs manufactured grand pianos and is available as an option for rebuilt instruments. During 2003, new equipment for soundboard manufacture was designed and constructed, including a dedicated pneumatic sound board press and a sound board panel drying box. Sound boards are now constructed using the rib crown principal. Soundboard panels are now, by default, made from laminated construction. The use of accurately quarter sawn wood for the construction of sound board panels improves the dimensional stability, which also improves tuning stability. Laminated sound board panels (with 100 % spruce) exhibit superior tuning stability compared to conventional solid sound board panels. Titebond extend is used for rib to sound board glue joints. During the period June to August 2003, an intensive period of sound board research lead to a completely new sound board design (patent pending). This technology is being incorporated into the construction of Overs 225 pianos no. 4 and 5. A Kawai KG5 is about to become to first rebuilt grand piano to receive one of the new sound boards. The above photograph, was taken at Sydney Town Hall during the1999 Festival of Sydney, featuring the ABC's circ' 1986 Steinway D (rebuilt March-May 1998) and Overs Piano's Hire Steinway D (rebuilt 1995-96). Custom rebuilt instruments are supplied with an adjustable bench, free standard delivery to the Sydney metropolitan area and a ten year warranty. A new Steinway D would cost in excess of AU$178,000. A remanufactured Overs modified Steinway D can be supplied for the sum of AU$120,000. We are confident that the custom rebuilt model D pianos are more than a match for the new factory original instruments. Over the past ten years, Overs Pianos has rebuilt many grand pianos incorporating design modifications. During 1999, a Kawai KG6 (7'4") was rebuilt with several modifications, under commission from the Independent Theatre in North Sydney. The Independent Theatre's KG6 is now a fine piano, setting new standards in action response. Tonal balance across the bass-treble break is very even following the sound board impedance changes. It is now unlikely that Overs Pianos will be rebuilding additional modified Kawai KG6 rebuilt pianos for sale, since the new Overs Steinbach 225 cm grand piano is now in production. These new pianos feature the Overs action, and a modified sound board with a new string scale and bridges. The retail price of the new Overs-Steinbach 225 has been set at a competitive market entry level of AUD $89,000 (plus 10% GST if sold within Australia - export instruments are GST exempt). Pianos 004 and 005 now under construction - can be reserved by placing a deposit. Over the past ten years we have rebuilt several Yamaha C5 grand pianos. This C5, previously a fine recording studio piano, was rebuilt from October '98 to February '99. After the inclusion of several design improvements, we are delighted with the tonal quality of this piano. A new Yamaha of this size would cost AU$43,000. We can supply these pianos rebuilt for the sum of AU$29,000. Beware of second hand 'grey market' (ie. second hand imported - mostly Japanese domestic market) pianos which are often presented as having been completely renovated or rebuilt in Japan, or in good condition. Approximately 6000 'grey market' pianos are sold in Australia each year. Representatives from Overs Pianos have inspected second hand imported Japanese pianos which were represented to be in excellent condition (A grade), when clearly they were not. Beware of dealers big on polishing the outside case, who a not prepared to clean out dust and dirt from under the keyboard. While a small proportion of the 'grey market' pianos are in excellent condition, many leave much to be desired. A large proportion of ex Japanese home market pianos have been kept in conditions of high relative humidity (often in the same room where food is prepared). Many of these pianos have evidence of moisture damage and occasionally cooking oil condensation ('tubby' bass strings are common). Beware of so called 'reconditioned' pianos selling for 20-25% of their new value. These instruments will almost certainly not be reconditioned. Usually they are just very basically serviced, strings 'cleaned' with steel wool, then flogged off to the unsuspecting purchaser. If you are considering the purchase of any 'grey market' piano, please be sure to have it inspected by an accredited technician before you commit to a purchase. It is a small price to pay to ensure that you a not buying into a pack of troubles. Last updated, 17 Feb 2001.